Don’t get me wrong. I love summer, with its long days and lingering warmth. But I do like riding my bike at night and I’m usually not willing to wait until 10pm to slip on my chamois, at least to ride by myself. Enter the Vapor Trail 125. I had heard rumors about this race in Salida, CO, for the last few years. Everyone talked about the high elevation, loads of climbing, 40 minute hike-a-bike and 10pm start. And then in the next breath they all said it’s the best race of the year, the trails are great, the views are amazing (when it’s light) and the vibe is super chill. Since I couldn’t reconcile those two views I figured I should find out for myself. After lucking into an entry in the sold out event, the real stress began. I started asking questions of friends who had raced it before and sent emails to Tom Purvis, one of the race directors. He graciously answered every one of my petty questions: score one for the chill vibe. I still wasn’t sure about my race plan 2 hours before the start so I even cornered course record holder Josh Tostado to milk any information from him that I could. Alas, I showed up to the start line on the F Street Bridge in downtown Salida feeling unsure of myself. In case you’re wondering, I went with a pretty high safety factor of extra clothes, liquid and larger light batteries. The long, neutral rollout through town brought everyone out of the restaurants and bars to cheer. Then we were left to ourselves to climb up the first of several long dirt roads, this one taking us to our first section of Colorado Trail. Having never ridden these trails, I would’ve liked to have had some company, but I was stuck in no-man’s land between groups. 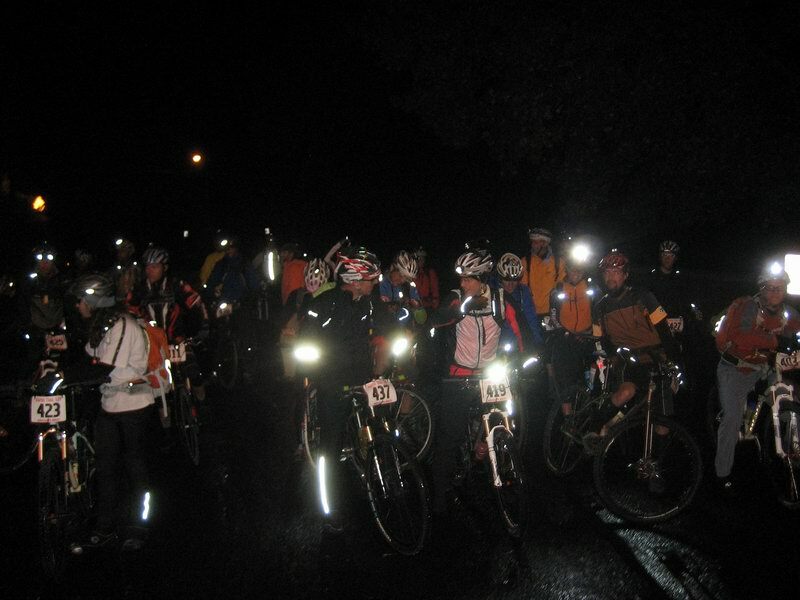 It was definitely exciting to rip these trails solo, in the dark, at race pace. Suffice it to say I blew more than one corner. My first crucial error came about two hours in when I dropped down to a pretty significant creek. I gave a cursory look upstream for a bridge but failed to look downstream. Seeing nothing I dove in to ice cold water well over my hubs. Climbing out the other side I saw the bridge to my right and would’ve kicked myself for being so dumb if my feet weren’t soaked and already going numb. This could make for a long night. One difference I noticed between this race and a 24 hour race was that time seemed to go faster. I attributed it to the fact that I wasn’t riding the same 45 minute loop and seeing the same people. I saw exactly two racers after the first hour of the race but at each of the five aid stations I was greeted by fresh, excited, smiling faces who were tripping over each other in order to help. And this was in the middle of the night and they were going to be helping racers for the next several hours. Awesome. The longest section between aids, which happens to have the most climbing and be in the wee hours of the morning also brings the hike-a-bike. I was actually looking forward to the hike proper because as I climbed Tomichi Pass, I wanted to hike but figured if the fast guys were riding it then I should too. I breathed a sigh of relief to finally come to a section of trail that I knew no one could ride and I could get off my bike with pride. And then, the reward. An hour-long descent of Canyon Creek with the Light and Motion Seca and Stella lights burning bright all the way to the second aid station. What a treat. The hour-long climb back up to the Continental Divide and Monarch Pass did give me a dose of reality. But I was greeted with bacon, so how sour could I be? From this point on, the aid stations come more frequently, the trails are great, the sun is up and there’s only the grunt up Poncha Creek to spoil the mood. And the gazillion punchy little climbs on Rainbow Creek. On a regular day I wouldn’t have noticed these, but after 110 miles I was cursing the trail builders. Finally, one last set of switchbacks to drop onto Hwy. 285 and the paved descent back to town. The only thing standing between the finish line and me was the crosswind which threatened to overpower my worn-out triceps and toss me into the ditch. Thankfully, I persevered, found my way to the parking lot behind Absolute Bikes below the huge “S” on the hillside and was handed my finisher’s award: a ticket for a free hamburger from the River’s Edge patio grill. Score one for the chill vibe.